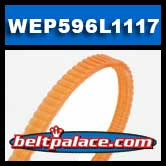 OEM Replacement WEP596L1117 Belt for Massage Chair. Orange Polyurethane construction. Replaces any Massage Chair motor belt marked "84J" with 3 ribs. NOW IN STOCK! Limited quantities available. OEM Replacement for Panasonic and Other.